Diversity Plaza | Bringing all nations together in Jackson Heights! 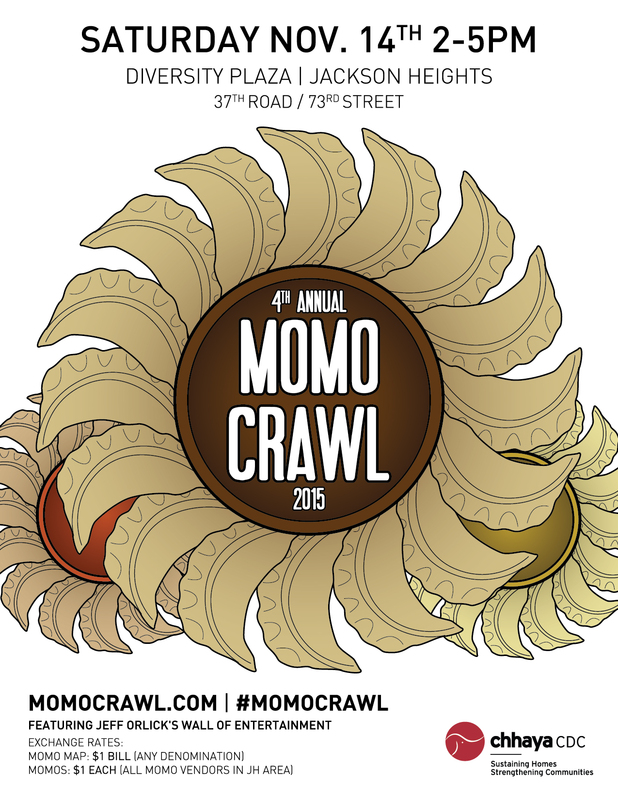 Announcing the 4th Annual Momo Crawl. This event is a showcase of the Himalayan community of Jackson Heights through its culinary ambassador, the Momo. The Momo Crawl is an open house for the neighborhood. Exchange 1 bill of any denomination for your Momo Map, then crawl the neighborhood enjoying $1 momos sold individually at every momo restaurant within walking distance from the Jackson Heights subway station (there are over 20). From first year of 30 friends, to 80 crawlers in the rain in 2013, the event ballooned to 800 last year. This event is now Jeff Orlick’s premier event, showcasing the food, the revolution, that is the momo – and the Himalayan community that sells them. This year, we are spotlighting the fact that Jackson Heights, Queens is the Momo Capital of the West. There are more places selling momos here than anywhere else in the Western Hemisphere, and the quality is among the best in the world. Look forward to entertainment and partnerships throughout the crawl utilizing Jeff Orlick’s Wall of Entertainment. What is a momo? A momo is a Himalayan dumpling. The fillings, flavors, and even shapes are not strictly defined yet the presence of the world momo, spreading from Tibet to Nepal, Bhutan, India, and beyond shows the power and resilience of the culture. Want Updates from Diversity Plaza? Bringing all nations together in Jackson Heights!